This stretchy Ferrari 360 Modena has been a ray of sunshine in my life during these long, dreary, overcast months of winter. Everything is gray and cold. 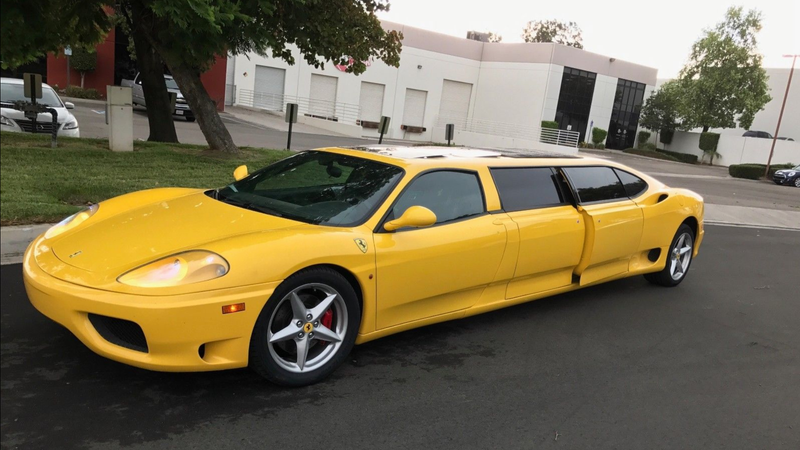 This Ferrari limo is not. I really can’t understand why no one bought it on eBay. This 2003 Modena went from two doors to six in 2017, according to its listing, with Los Angeles’ I Ride Like A Star (good name) appearing to be the shop that turned it into a quirky limo. But its new seats and seemingly original V8 didn’t meet the $95,000 reserve price, and appears to have gotten no bids at all. Ridiculous, I say. This was a missed opportunity. I, for one, love rolling up to the fanciest of events in a vehicle that looks like a giant banana. After all, bananas are best food to eat in public, and banana is everyone’s favorite artificial candy flavor. This Bananarrari will bring people nothing but happiness and hope, as it’ll be the brightest thing they see for miles—other than, perhaps, the strings upon strings of fake jewels I would wear to step out of this if I rented it, in hopes people would think they were real. That’s just me, though. Plus, just check out this seating layout. Nobody pays a stupid amount of money to rent a limo so that they can sit across from each other, drinking and talking about old times. None of you look as good as you did in those times, anyway, so it’s better to treat it like the neighbor’s van taking you to baseball practice. Nobody has to look at each other, and there aren’t Cheetos on the floor! That’s what you get when you pay for a Ferrari limo. It even has the televisions in the back of the seats. Oh, Bananarrari, just take me on that family vacation with the 16-hour drive that I dreaded so much as a kid. We have the perfect setup. I’ll pop in a Scooby-Doo! movie and we can head to the overpriced and overcrowded ski slopes or something—just like old times. I can just see my parents arguing over the 32 pages of Mapquest directions they printed out in the front seat now. That’s about the time when I would pretend to fall asleep, but these seat bolsters seem a little too intense for that. Early 2000s Modenas at their normal length tend to list for about $60,000 to $100,000 these days, and this is, like, double a Modena for that price. Plus, eBay lists this car as having nine owners across nearly 32,000 miles on the odometer. It must be popular. Honestly, I can see why. Would You Be A Fool To Buy This Foolin&apos; 2003 “Ferrari 360 Modena" For $21,500?